The normal adult lumbar spine (low back) has 5 vertebral bodies (bones). 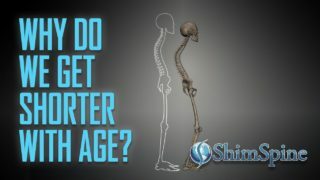 There is some variation to this as some only have 4 vertebrae while others have 6. The lumbar vertebrae are labeled L1 to L5 and are larger than vertebrae in both the cervical and thoracic spines. Below the lumbar spine lies the sacrum and coccyx. A healthy lumbar spine features a lordotic curve. 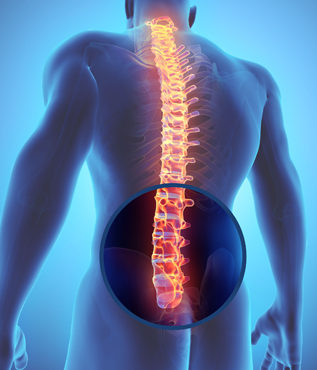 Similar to the rest of the spine, the vertebral bodies are supported by a structure of muscles and ligaments. The muscles of the lower back and ligaments are thick fibrous bands that help stabilize the spine and allow for activities such as bending and extending of the spine. The ligaments limit excessive motion. Similarly, the facet joints within the lumbar spine allow for motion. In the case of degeneration or injury, the facet joints can be a potential source of back pain. As in the cervical and thoracic spine, each vertebral body features a bony ring that forms the vertebral arch that contains the spinal cord. The spinal cord itself ends around the level of L1, and the spinal nerves below this form the cauda equina (literally meaning “horse’s tail”). There are 5 pairs of spinal nerves from within the lumbar spine. 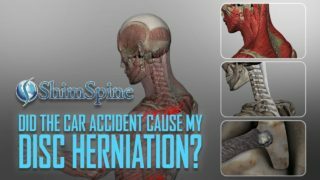 Common conditions such as a herniated disc or spinal stenosis can cause compression of one or more of these nerves. The main purpose of the lumbar spine to help support the weight of the body while allowing for some motion.